In India nearly 750 million people use mobile handsets. It is the only device that has reached masses in such large numbers. Even as number of mobile devices have risen over past decade, one aspect has not got as much importance as it should have – The mobile safety standards. Though it has been hotly debated whether mobile devices are completely safe or not, there is doubt that they emit radiations. Some mobile phones have higher radiations, some have low. However, it’s effect on humans has not been proved conclusively as yet. Now, it looks like Government is taking a serious note of the same. To enhance safety standards of mobile devices, they are planning to bring it under the Telegraph Act, 1951, reports Business Standard. Bringing it under the Telegraph act will ensure that all mobile devices whether made in India or abroad will have to compulsorily display SAR (Specific Absorption rate). SAR is a unit to measure the radiations emitted by mobile devices. In 2012, Government of India had bought down the SAR value requirements from 2 watts a Kg to 1.6 watts a Kg. This ensured that only those mobile phones were allowed in India who had lower level of radiations. According to recent DoT discussions, bringing mobile devices within the definition of “Telegraph” will ensure that all mobile handsets will get certified as “safe”, after being screened at local labs. Under current circumstances, DoT cannot explicitly demand this compliance, as mobile handsets are currently categorized as consumer goods. On the other hand bringing it under “Telegraph” will make it part of telecom infrastructure and equipment, which require stringent checks and certifications. Currently, most big mobile brands do show SAR values, but users are not aware of it too much. A user has to (in most cases) key in ‘*#07#’ to get the SAR value (see the screenshot above). However, many low cost handsets and china imported phones do not show it. 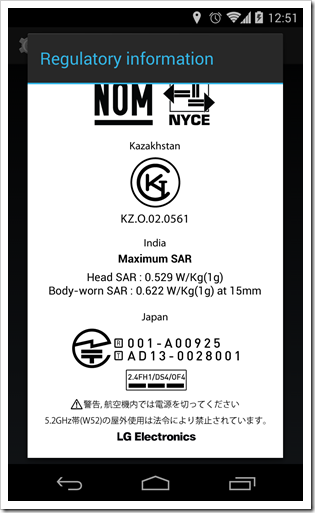 The proposed norms direct that all mobile handsets will have to display SAR measurement values on the handset itself (like it is in case IMEI number). They should mention the SAR values if handset in the manual as well as display it when ‘*#07#’ is keyed in by mobile user in the handset. The new norms may also need the manuals and booklets to have details of mobile safety precautions. The Government will also enforce self declaration of handset makers for conformity to SAR level of mobile handsets and testing in International Laboratory Accreditation Cooperation.